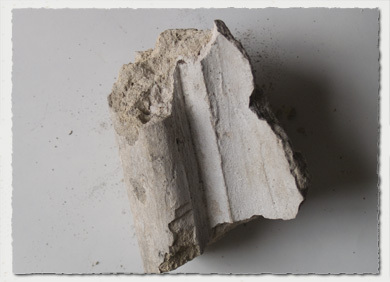 Where ever you make an excavation in a matter of moments some small pieces of plasterwork come to light. The header image with four small pieces of plaster are an example, together they make a small part of a ceiling rose. The circular ribs on the perimeter and in the centre a bunch of grapes. Many such pieces have been found but alas it has not been possible to crearte a full ceiling piece. 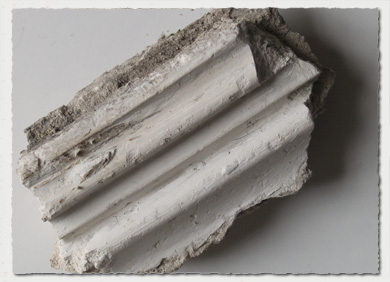 The fragments of plaster all appear to be painted in a lime wash, a traditional process used to paint flat wall surfaces in times prior to the adoption of modern chemical techniques, using vinyl based paints. 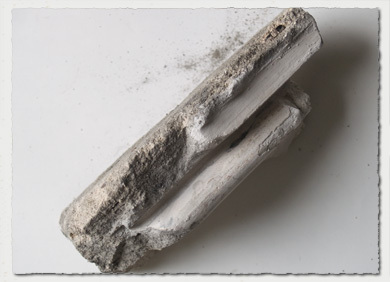 If you want to know more about lime wash and other tradional painting techniques try this search in Google: lime wash paint. 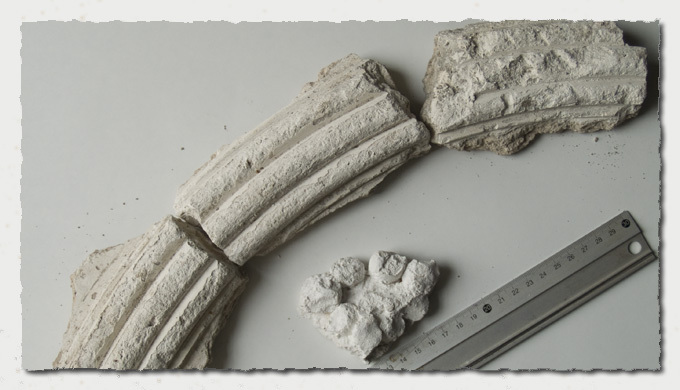 All the small pieces of plasterwork undoubtedly have a history, but we will never know about them. However in the 1730's Sir Edward Gascoigne engaged the Italian craftsman Vasali to produce fireplace pieces and other baroque finishings, perhaps some of the pieces shown here form a part of his work? Thus I had hoped that some pieces of the work of Mr Vassali might be discovered amongst the remains of the demolished building. The pieces mentioned here are probably later, I suspect from the upper storey of the Drawing Room section. Mr Vassali is mentioned in the book in various places as having been employed in numerous Stately Homes, this may be worth exploring in more detail in the future. The information on classical plastering has been enhanced by information sourced from the highly regarded book Decorative Plasterwork in Great Britain , by Geoffrey Beard. First published by Phaidon Press Ltd 1975 ISBN 0 7148 1686 8.